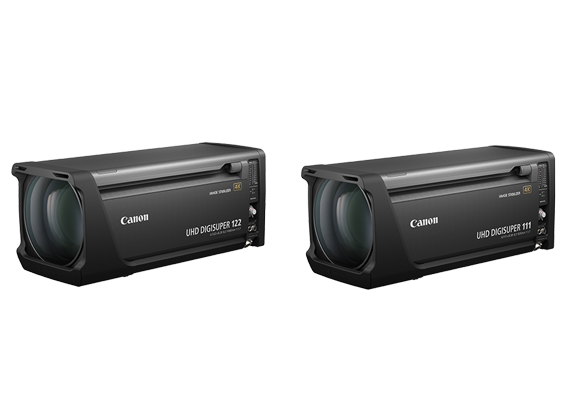 SINGAPORE, 12 September 2018 - Canon today announced the launch of the CJ25ex7.6B, a new addition to its UHDxs series1 of portable zoom lenses for 4K broadcast cameras employing 2/3-inch sensors. The CJ25ex7.6B is a portable zoom lens capable of 25x zoom ratio with a focal length ranging from 7.6mm to 190mm while achieving superb optical performance. The compact, lightweight design affords the lens excellent maneuverability and operability, making it ideal for a wide range of applications - in both indoor and outdoor locations - including sports broadcasting and news reporting. Employing fluorite and Ultra-low Dispersion (UD) glass, and a proprietary optical design that places these materials in optimal positions, the CJ25ex7.6B suppresses chromatic aberration from the center to the periphery of the image across the entire zoom range and achieves high resolving power and high contrast for high-resolution video capture. With a lens coating technology and a design that prevents reflection within the lens barrel, the lens reduces the occurrence of ghosting and flaring to achieve superlative color reproduction ideal for HDR2 and WCG (Wide Color Gamut) video shooting. The CJ25ex7.6B employs a new zoom system that reduces deviations in optical performance that can arise from zoom operations to realize high-resolution, high-contrast imaging from the center to the periphery across the entire zoom range. The CJ25ex7.6B weighs approximately 1.99kg3 and measures 169.6 (width) x 114.1 (height) x 223.3 (length) mm. The compact and light body design of the lens offers a high level of convenience and maneuverability demanded in fields such as news reporting and documentary production. The Canon CJ25ex7.6B IRSE S, a manual focus-type model, and CJ25ex7.6B IASE S, which incorporates an internal focusing motor, will be available in March 2019. 1 A series of lenses with high optical performance for 4K cameras employing 2/3-inch sensors targeting advanced-amateur users. 2 High Dynamic Range refers to a technique that enhances the contrast between light and dark values (the dynamic range) of an image. 3 For the CJ25ex7.6B IASE S. The CJ25ex7.6B IRSE S weighs approximately 1.91kg.